Search Our Inventory / All Rugs / 12&apos; 4" x 17&apos; 11"
12&apos; 4" x 17&apos; 11"
We maintain a selection of the most beautiful early 20th century carpets in high pile condition available, ideal for heavily trafficked areas and young families. 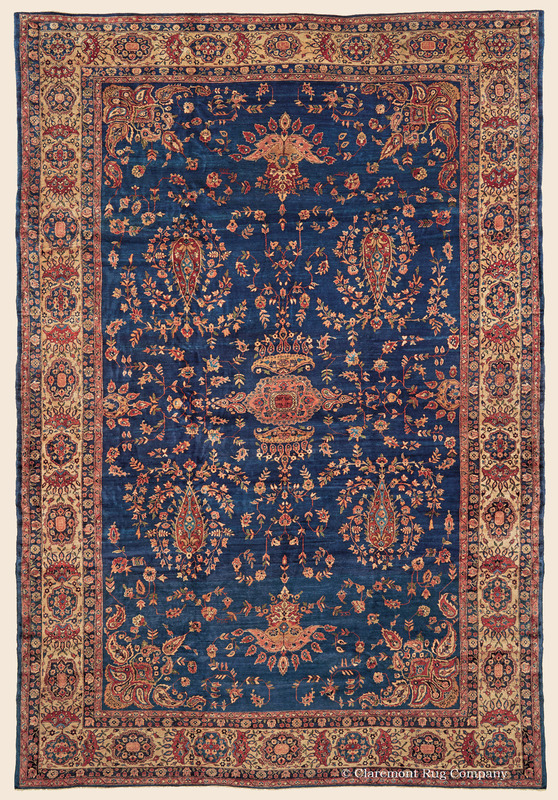 This oversize carpet is an excellent example of the best of Mahajiran Sarouk vintage rugs. The style offers luxurious wool and charmingly drawn floral field designs that seem to float on quietly striated backgrounds of either soft reds, or more rarely, deeper blues. In this superb representative, the hues include luminescent indigo blue, soft terra cotta, burnished gold, salmon, copper, cerulean, and jade green.